Arkay Windows want to give you have the freedom of style while reaping the benefits of modern-day window technology. Give your home a beautiful edge with our vertical sliding sash window and choose from an incredible range of styles, colours and hardware options to fully customise your vertical sliders. Manufactured on site, our sliding sash windows have stunning aesthetical appeal and complement any property effortlessly. Choose Arkay Windows today for impressive sliding sash windows today. With over 30 years of experience in the industry manufacturing a variety of windows (including sash windows), doors and roofs for customers in Watford, North London and the surrounding areas, we capture the designs that you have in mind. With accreditation from Secured By Design and BM TRADA, our sliding sash windows are perfect for not only their unique composition but for keeping you and your family safe and secure. It is crucial that everyone feels protected and shielded from potential intruders. No-one deserves to feel unsafe in their place of comfort. Every detail of our vertical sliders is constructed with safety in mind – with internal beading and meeting the PAS24 requirements. Advance locking mechanisms are built into all sash windows, as well as double or triple glazing options to enhance the security standard to a higher degree. Striving to exceed security regulations is a task we undertake to provide our customers with peace of mind. Opting for traditional designs doesn’t mean you should have to discredit your home security. When choosing us as your sliding sash windows manufacturer, you are guaranteeing exceptional protective performance with a robust yet visually appealing design. Take a look at our showroom with our virtual reality tour. You can take a look around from the comfort of your home or desk, with an insight into the Arkay Windows showroom. See the quality of our sash windows through our VR tour. Take a look at our videos that show why the uPVC VS window range is such an excellent choice. Discover a traditional aesthetic with effortless modern performance. 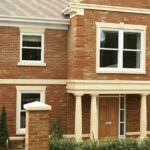 We here at Arkay Windows are proud of our secure and thermally efficient sliding sash windows. All our profiles meet the Windows Energy Rating of A+ 12 ensuring that heat doesn’t escape your home through poorly manufactured products. Enjoy a pleasant climate in your home as your sliding sash windows keep the cold, wind and rain at bay. Tailor your design to your current structure and discover a world where traditional sliding sash windows meet contemporary compositions. Heritage homes can have their performance fully optimised with the installation of sliding sash windows. When choosing Arkay Windows, you will never have to compromise on aesthetics over practicality. Our uPVC sliding sash windows are incredibly high performance, energy efficient and are a stunning addition to any home. Take a look at the brochure below which is available as a download. In this brochure you’ll find the technical specifications for the uPVC VS range. Your home doesn’t have to be dull for it to be practical. Here at Arkay Windows, we deliver stunning designs that make your property eye-catching and engaging. Passers-by and visitors will be envious of the traditional sliding sash window style that boasts high performance and dramatic visual appeal. Along with the vast amounts of features of benefits that come with our uPVC sliding sash windows, there is an exceptional display of choice to make to customise your windows to your home. We can advise and help you find the perfect fit for you. We will tailor make sliding sash windows to your specifications. Reduce your carbon footprint and your energy bills with sleek and stylish windows. You don’t have to compromise on aesthetics to be thermally efficient. With sculptured and chamfered profiles to choose from – you can rest assured that you’re getting incredible high-quality sliding sash windows. Contact us today to get your free, no-obligation sliding sash windows quote. We manufacture windows for residential and commercial structures – no project is too big or too small. Request a quote through our online engine to get a price that is tailored to your specifications. Alternatively, you can fill out our online contact form, and one of our professionals will get back to you as quickly as possible to answer your enquiries. We are more than happy to recommend products and advise you on getting your sliding sash windows installed. Are Sliding Sash Windows Secure? Durable and robust profiles, double or triple glazing options along with robust locking mechanisms work together to create a resilient and unsurpassable design. Adding these windows will leave garner relaxing peace of mind for the security of your London property. Is It Possible To Customise The Design? Vertical sliders should blend seamlessly with your property; the design is one of the first steps to achieving this. Whether you’re after a bold statement colour or a timeless muted approach – we have the options for you. Combined with our finishes and hardware options, your sliding sash window will beautifully complement your home and optimise performance. 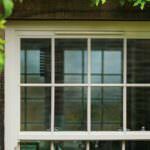 Are Your Vertical Sliders Thermally Efficient? Yes, all our double glazing options are thermally efficient. Our profiles achieve incredibly high energy ratings along with excellent U-values. We install our vertical sliders with multi-chambered profiles, glazing flipper, thermal dam and patented co-extruded bubble gasket which all work to help reduce your carbon footprint and your energy bills.